This film #1 is on the Worst of 2004 list. As I write this, the time is 8:32 p.m. on Thursday, November 18, 2004, and I have just walked out on "Christmas With the Kranks" after roughly 45 minutes of mind-numbingly humorless, sit-com barrel-bottom idiocy. An adaptation of John Grisham's "Skipping Christmas" that has been violently stripped of any semblance of humanity, this supposed comedy is about a couple called the Kranks (ha, ha, ha), played by Tim Allen and Jamie Lee Curtis, whose daughter won't be home for Christmas, so they choose to bow out of the festivities altogether and take a cruise. But apparently their choice amounts to a social offense of the first order in the bogus, plot-device suburbia where the movie takes place (during a transparently bogus winter). It even makes the newspaper. Soon an army of neighbors are beating down their door like some Yuletide Gestapo, angrily demanding they put up their seasonal decorations while Curtis inexplicably cowers inside like a child. For no explored reason Allen has played into all this bitter sentiment and decided their vacation must be nothing short of a complete Christmas boycott. He insists they not send Christmas cards, not buy or receive any gifts -- and his wife, who likes Christmas but lacks any kind of backbone -- just goes along with it. Directed by Joe Roth ("America's Sweethearts") with such out-of-whack comic sensibilities that at one point the plot is suspended entirely for an unrelated set piece about Allen getting Botox injections (watch him try to eat while his face is numb -- ha, ha, ha), the first half of "The Kranks" is drowning in lethargic, tediously telegraphed gags that fall completely flat. Example: A flatbed truck full of gung-ho carolers just happens down the street and is told by disgruntled neighbors that the Kranks need to be force-fed some Christmas spirit. Two or three whole songs later, Allen and Curtis are still running around inside the house trying to hide. 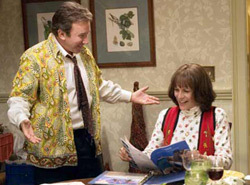 But Roth is only partially to blame, as the film was written by the gratingly prosaic Chris Columbus (writer-director of "Nine Months," director of "Bicentennial Man," "Stepmom" and "Mrs. Doubtfire"), who has throughout his career required lengthy set-ups for obvious and artificial punchlines delivered by one-dimensional, artificial characters. On that count "Christmas With the Kranks" hits a new nadir. There is not a single lifelike character in the entire picture. Then, just as I was thinking the movie could not possibly get any worse, it did. The Kranks' daughter (Julie Gonzalo, who doesn't look remotely like either Allen or Curtis) calls from the Miami airport. Despite having joined the Peace Corps in Peru just three weeks before, she's coming home for Christmas after all, setting into motion a zany emergency backtracking of everything the movie spent half its run-time setting up. For some reason the Kranks are in a panic that the girl not find out they'd made other plans. After all the insufferably hackneyed slapstick I'd sat through during the anti-Christmas part of the plot -- the part that at least has promise in theory -- I knew I couldn't stomach being dragged into another hour of these disingenuous, laugh-deficient characters falling all over themselves to pull off a traditional holiday after all. So I got out while the getting was good. Whenever I review a movie I've walked out on (the last one was 2002's "Resident Evil"), I always get chided by those who consider it my duty as a critic to grit my teeth through awful movies in their entirety. But the way I see it, there could be no clearer review. If you saw a movie that was so torturous that you walked out, would you hold your tongue?